Get out of my way... now! Always angry. Extremely combative. Enjoys pushing other Decepticons around, but only if they're weaker than himself. Recon missions are his specialty. Clears battle perimeters of fallen Autobot wreckage in minutes with his heavy-duty front end "super shovel." Has no fear of engaging an enemy. Uses spinning saw blade to slice open armor like a machete through birthday cake. Fires powerful "penetrator" missiles that bore through double-thick, armor-plated shielding to assure Autobot destruction. Robot Mode: A big, bulky robot, Roadblock leaves little doubt as to what he transforms into. The big shovel of his alternate mode forms his chest and makes him look strong and tough. His lower body is pretty much a brick, but his arms are fully posable. One carries a buzz saw, the other includes a missile launcher. He can also turn his head and his detailing is quite well done. 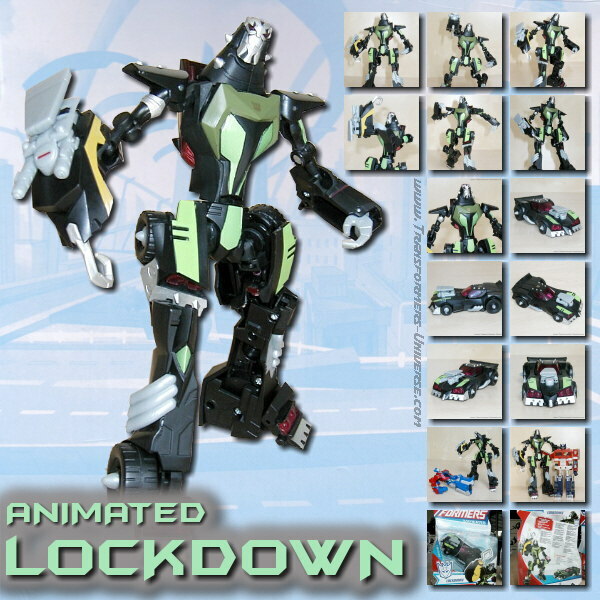 So overall I can only say that Roadblock, while nothing spectacular, is a good, solid robot. Alternate Mode: Roadblock transforms into a payloader by way of the Autoroller-gimmick. Meaning you flip the switch on the back of his feet and then simply roll him across the floor. He folds down and into his vehicle mode (though you have to fold his arms together first). A simple, but surprisingly effective and well-executed gimmick. Interestingly construction vehicles have mostly been the hallmark of the Decepticons in Transformers, despite being civilian designs. Anyway, Roadblock makes for a pretty realistic-looking payloader, offering no obvious hint that a robot is hidden inside. The big shovel can be moved up and down, the detailing is good, so overall: No complaints. A solid vehicle mode. Remarks: Roadblock, along with Dirtbag, formed his own subline in Generation 2, the Auto-Rollers, named after their auto-transforming gimmick. Neither ever appeared in the comic books, but they were recycled for the Beast Wars II cartoon series. Roadblock was renamed Autocrasher and served under Galvatron in that Japanese exclusive series. As a toy Roadblock manages to combine a rather amusing gimmick with a decent amount of detailing and posability into an all-around good figure. He's certainly not a revolution, but a good, solid toy that offers few grounds for complaint. Recommended to all G2 fans.